Medieval life had many facets and medieval castle life in particular conjurs up many vivid pictures in our imagination. Here is one such picture .... a medieval knight in his castle hosting medieval banquets on special occasions throughout the year with medieval jesters and medieval music for entertainment. What a colourful scene! First of all, there's the food to consider. Vegetables and medieval herbs (such as rosemary and sage) grown in the castle's own medieval garden; meat from locally farmed cattle, sheep, pigs and chickens and fish from the local rivers running through the castle estate. Secondly, the entertainment. A medieval jester was an all-rounder with a variety of skills - he had to be to survive! Thirdly, the music. 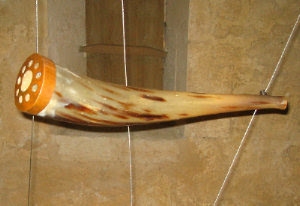 Nothing like what we know as musical entertainment today, medieval music was reliant upon the skills of the singer/player and in a musical troupe there would often be a fiddle and/or a horn player. 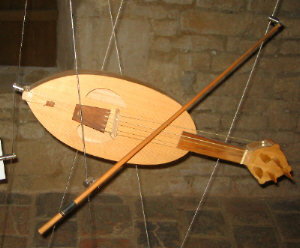 Here are photographs of modern-day copies of what these 2 medieval instruments looked like. When Were Medieval Castles Built?